Superior Surface Refinishing Inc. uses what we believe to be the best coatings in the refinishing industry today. We use these coatings because they have been custom designed for the refinishing industry and are known for there durability, color retention and excellent adhesion. Having incredible coatings is a must, but if you don’t have great equipment to apply the coatings, it defeats the purpose. We use the Lemmer T-95 HVLP Turbine system. With a 3 stage turbine and built in compressor it can handle any refinishing job. Lemmer builds there equipment in Canada, and has been an integral part of the Canadian spray industry since 1965. We also have added a new Graco HVLP Turbine system with a built on compressor to our line of equipment. The Graco Turbo Force Technology is the latest in HVLP technology. HVLP (High Volume Low Pressure) sprayers are used for fine finishing so overspray is kept to a minimum. We also use an exhaust system to vent dust or fumes out of the work area and outside of your home so to keep odours to a minimum. We know you take pride in your home and we respect that, so we use drop cloths and poly plastic to cover surrounding areas even though it may be more than necessary. 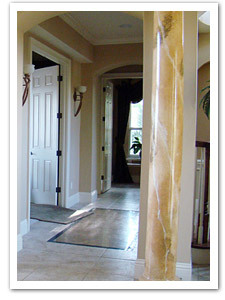 At Superior Surface Refinishing we use care and caution respecting your home as we do our own. When choosing a professional refinishing company, you should expect nothing less. In preparation of our technician arriving, we only ask that you remove all loose items from the bathroom or kitchen area where the refinishing will be done. This includes curtains, pictures, shower accessories, and loose rugs. In the kitchen any appliances or items kept on the countertop should be removed and window coverings that hang low enough to be in the way or that can’t be raised up and secured well. If you are planning to replace plumbing fixtures with new ones after we refinish, the old fixtures should be removed before we arrive. New fixtures can usually be installed the day after the refinishing is complete. During our refinishing process we need access to 2 electrical outlets for our exhaust and spray equipment as well as running water. We first prep the area we are working on and in the case of tubs or tile depending on the type, we use a chemical etch and, or other processes to ensure proper adhesion. Then we apply our primer coatings, and then our finish coatings. When using Createastain for countertop refinishing, we apply it onto the primer creating our faux finishes, then apply a clear high gloss topcoat to give it incredible depth and feel of polished stone. Browse through the rest of our site to see the beautiful refinishing results and check out Why refinish ?